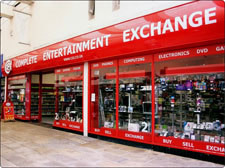 If you are looking for information on the Complete Entertainment Exchange franchise business opportunity, CEX franchises or Complete Entertainment Exchange franchising, then you have come to the right place. Business is now expanding in the US. Huge Demand and a Proven Business Model? 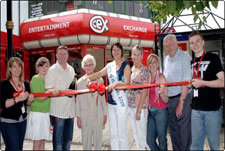 The CeX franchise (Complete entertainment eXchange) is searching for individuals or partners to share its passion and vision for the company. 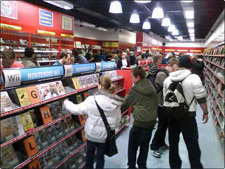 The CeX concept has spread over the UK, Spain and is now the USA (and our sites are not stopping there). We currently have over 100 retail stores (56 corporate and 46 franchise stores). CeX specializes in digital entertainment and propels the idea firmly into the 21st century with a business opportunity that combines traditional trading principles with up-to-the-minute in-demand products. There are always people who must be first to have the newest, latest and the most up-to-date lines in whatever they purchase. As they upgrade to whatever is new this week, they are looking to dispose of "last week's model". Most of us, however, are content with "last week's model", and if we can pay less by purchasing a slightly used item, we are more than happy. One man's trash is another man's treasure. CNBC's, Trish Regan recently reported, CeX is "A new kind of retail for a new kind of economy. This is a business that has seen enormous growth as a result of the recession." This works perfectly with our product range - whether it's video games, DVDs, mobile phones, handhelds, digital cameras and camcorders, MP3 players, computers and computer accessories etc. The size of this market hardly needs to be described. Equally, you will know individuals from the "I must have the newest" group, because they have made a point of showing you their latest acquisitions like it was their first-born baby. What you are imagining has been operating successfully since 1992. The CeX format has been successful because 1) of the rapid growth of the products we deal in, and, 2) it caters to the basic instincts of the two clearly defined groups of people described above. It's enormous and it's growing, fueled by the recession as the populations need to seek better value for money as well as generate additional cash. The market so far has proved large, enthusiastic and has consistently grown. We are trading in an area where changes occur rapidly - new products and upgrades of existing ones have become almost a daily occurrence. It's always fresh. The growth and success of Internet auction sites illustrates people's willingness to buy second-hand - our own experience confirms it. Human nature is acquisitive, and with the two types of individuals previously mentioned we have a ready source of supply and a massive source of customers. We know our suppliers and our customers - in fact, they are the same people. We've found OUR niche - want to join us in it?